Puerto Viejo is almost like a country on its own. The Reggae/Rasta vibe, Caribbean flavor, white beaches, and clear waters are reminiscent of Caribbean islands. Azania Bungalows is a lovely vacation getaway comprised of thatched roof bungalows just steps away from the Caribbean beach. Art & nature are at the center of this boutique hotel. Relax and enjoy a laid-back atmosphere by the Caribbean Sea. 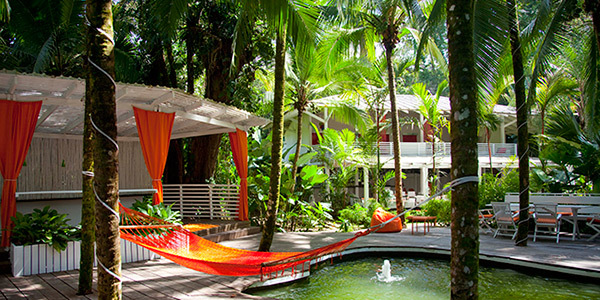 Veteran visitors to Costa Rica and travelers who prefer to venture off the beaten tourist path love hotels in Puerto Viejo for this unique vibe. Puerto Viejo de Talamanca is situated on the southeastern coast of the country, in the Limón province. Once, this was a quiet seaside town that has blossomed into a international destination with relaxed vibe of the Caribbean. Young travelers flock to the region’s shores to appreciate the gorgeous landscape, relaxed atmosphere and various attractions, which include several nature reserves, parks and a wildlife refuge. Thanks to many diverse Caribbean influences, you’ll be able to enjoy everything from reggae and calypso music to spicy seafood dishes during your visit. The area is also a popular spot for surfers, many of whom travel from all around the world to catch some waves in this gorgeous setting. Salsa Brava is the hottest destination for experts, but even beginners can reap the benefits of a surfing lesson or scuba diving and snorkeling tours – and all of this happens just a short distance from your Puerto Viejo hotel. If you work up an appetite while at the beach, head to the Chocolate Museum, which offers tours of the facilities that show guests just how this delicious treat is made from local ingredients. 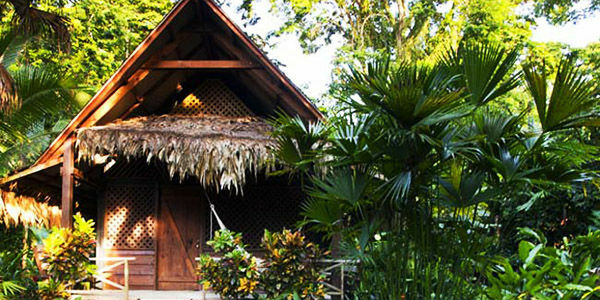 One of the best Puerto Viejo Costa Rica hotels for your consideration is the Azania Bungalows. These thatched-roof accommodations create an environment that blends seamlessly with the natural surroundings without sacrificing the amenities you’ve come to expect from a perfect trip. Each bungalow is private and features some traditional rain forest decor, along with bonuses like sauna showers, patios, hammocks and more. The freeform pool and Jacuzzi located on the grounds of the bungalows are encompassed by lush vegetation, and it’s all set just a few steps away from the gorgeous beach. If all of the nearby attractions and activities wear you out, you can sit back and dine on a meal at the Azania’s restaurant. Dishes made in the style of traditional Argentinian cuisine expertly fuse flavors together, providing all of your senses with a tropical vacation you will never forget.